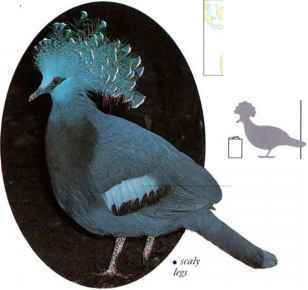 The lacy crest of this enormous pigeon is made up of fan-shaped tufts and is permanently raised over the head. Displaying males utter soft, booming calls as they show off their crests and tails to the females. Both sexes perform threat or defense displays in which they wag their tails and hold out one or both wings, like banners. This ground-feeding species lives on the rain forest floor, walking around slowly and taking fallen fruits, seeds, and berries. 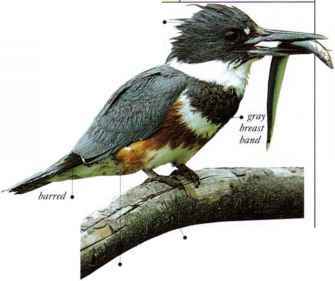 It Hies heavily, cither to escape danger or to ascend into the branches of the trees, where it also roosts and nests. • NEST A large, solid, platformlike mass of stems and twigs, in a tree.